After 4.5 years, we had our first real encounter with a trauma accident. (I’d say that’s not too bad!) 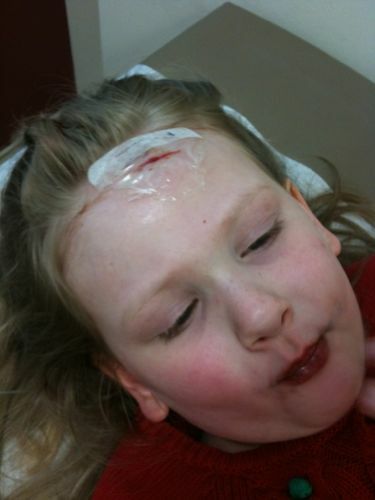 Sam was at school playing with bubbles on the playground when she tripped and fell into a brick wall. She put a pretty good hole into her forehead. 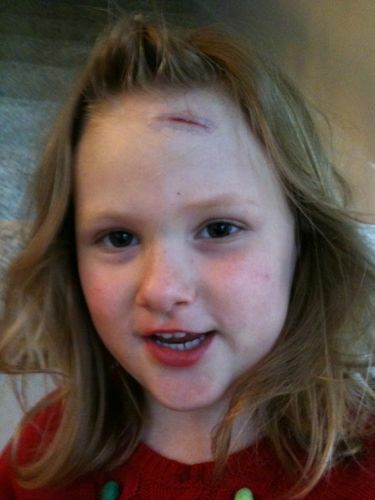 Obviously, head wounds bleed a lot (Alex, maybe you should stop reading here) and she was rushed to the office. They cleaned her up as much as possible, gave her a popsicle and called me. They told me that she’d probably need stitches. So, off I go to pick her up. 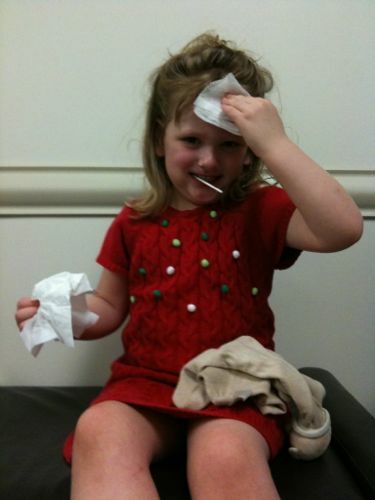 She was pretty shaken up, especially since we would have to go to the doctor. Sam is pretty terrified of the doctor. She made me promise to tell the doctor that she didn’t need any shots. I promised. The nurse had to numb the area. It was a goo that took 20-30 min to work. That was pretty traumatic. Then the doctor had to wash out the wound. That was even more traumatic. Then the doctor glued the skin back together. Oh, the horror. When it was all over with, she’ll tell you how she got a popsicle, a sucker, some reese’s cups, and some nail polish out of the deal. Maybe being hurt isn’t such a bad thing?